If you are organising a private, professional, commercial or community event: Take advantage of our facilities and welcome your guests, clients or suppliers in a verdant, tranquil setting. Villa Vicha can dedicate the whole site to your wedding. Villa Vicha offers its reception room, its panoramic terraces and its park to welcome your guests. Our outdoor spaces benefit from every comfort in a setting of peace and conviviality. Our five-hectare park is the ideal location for your photo sessions, and we can also host secular ceremonies. Our team is ready and waiting to make your day exceptional. For the comfort of your guests, Villa Vicha has 14 Danish-style chalets that can accommodate up to 58 people. When you reserve the whole hotel, your guests can stay on site and enjoy a free breakfast! Space is specially provided for the caterer, with separate access for discreet organisation. For your receptions, you get the benefit of a pleasant, stylish indoor space with a welcoming atmosphere. Our reception rooms can seat up to 130 people. The space consists of two communicating rooms: the restaurant seats up to 90 and the glazed lounge with its wooden floor can accommodate up to 58. 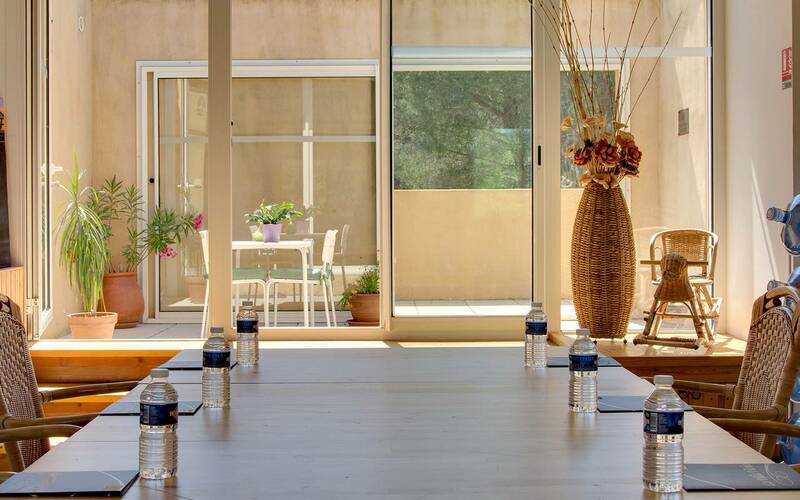 Combine work with pleasure in a peaceful atmosphere for your study days and residential seminars. Upstairs, two light and airy rooms are available, air conditioned and fully equipped. Downstairs we can offer a less formal room, also equipped and air conditioned. Depending on the weather, your lunches, dinners and/or breaks during meetings can be taken outdoors on the terraces.